It’s not going to compete with the big Easter markets, but the Kalvarienbergfest perhaps gives you a more authentic flavour of Viennese life. 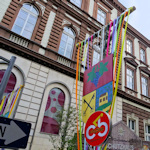 The Kalvarienbergfest in the district of Hernals sits away from the main tourist routes, but still counts as a familiar object on the Viennese Easter market scene. It has the feel of a local market, with decorated lampposts and small flower displays thrown in for a festive feel. So there are a handful of arts and craft stalls, places to grab sweets or traditional fried snacks (like a Langos or Baumkuchen), some jams, cheeses, hams and sausages for sale, little workshops for kids and a small carousel. Not to mention a stage for shows and local musicians. You won’t find many tourists here – it’s a lighter, downmarket version of the Easter markets that grab all the attention. But it does give you a flavour of real life in the city’s outlying districts. And the square at its centre has the rather pretty Kalvarienberg church. I wouldn’t make a special trip out to visit, not unless you want to delve into a more earthy, realistic side to Vienna. Hernals is not rich in Imperial history and monumental buildings. But it’s an honest, largely working-class area with its heart (and a glass of beer) in the right place. Regrettably (because I live there), Hernals is not the centre of the Viennese universe. But like anywhere in the city, it’s pretty easy to reach by tram. The nearest stop to Kalvarienberg is Elterleinplatz on the 9 and 43 tram lines. The 43 leaves from Schottentor in the city centre and is, coincidentally, Vienna’s most popular tram service. Alternatively, take the U6 subway to Alser Straße and then go on two stops with the 43 tram in the direction away from the centre.